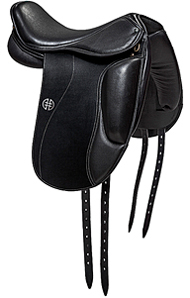 HRÍMNIR MASTER Hrímnir Master is a deeper seat saddle which helps the rider sit balanced, relaxed and upright. Its thigh blocks, above the knee support positions the rider to sit in a vertical position and promotes a better balance. It is extremely important to choose a saddle tree size which will position the rider legs up against the thigh support. When sitting relaxed in the saddle and the legs are not supported by the thigh support, the saddle tree is too long. Made from the highest quality leather.